Associate Professor Derek Paley (AE/ISR) and his graduate student Amanda Chicoli (Neuroscience and Cognitive Science) led a workshop for area high school students on July 26 that combined neurophysiology and robotic sensing technologies. “Robots and Roaches: Engineering applications and bio-inspired designs” was a one-day, university-level workshop for 20 students to explore how cockroaches sense their environment and relate it to how robots can do the same. 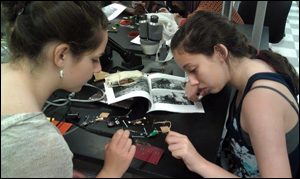 Students examined the electrical signals and neurons in a cockroach's leg, performed similar experiments with robots, and combined the two to discover how each could potentially control the other. The workshop was a Leadership Enhancement, Application and Design Academy run by the Clark School's Women in Engineering program. Hands-on activities like this are important to interest and motivate students to study science, technology, engineering and mathematics (STEM) disciplines. This workshop demonstrated how robotics can incorporate concepts of animal neurophysiology. Television crews from WRC Channel 4 and WUSA Channel 9 in Washington, D.C., and CTV in Prince Georges County were on hand to film the activities in the BAE Systems Controls Instructional Laboratory.